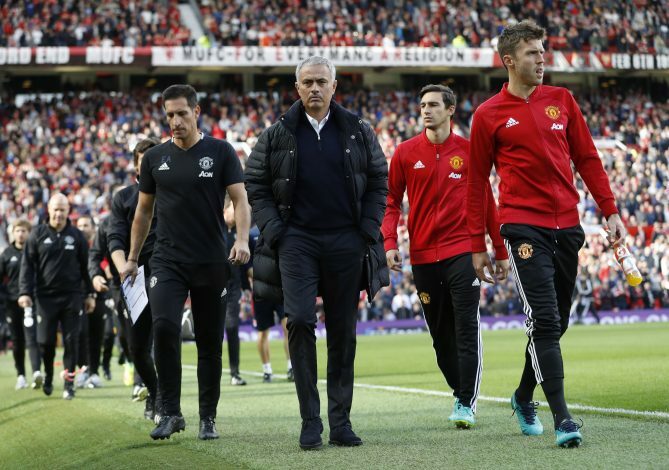 Manchester United stars are disappointed with the way Jose Mourinho has handled Chris Smalling and Phil Jones, even if both players are injured. Mourinho had publicly called out the duo twice to play through pain, ahead of Thursday’s derby against Manchester City. Moreover, the former Chelsea boss questioned the duo’s mentality, while asking them to be braver. This has left some of their teammates questioning the manager’s attitude, the Daily Mail reported. Mourinho has also repeatedly questioned Anthony Martial and Luke Shaw publicly. Even though Marcus Rashford seemed to be out of favour with the Portuguese, he has since returned to form. This has lead the former Real Madrid boss pointing out his attitude. But while doing so, he obliquely​ called out some members of his squad for their weak mentality. “When you give everything you have I cannot demand more,” Jose told Sky Sports. “Even Marcus [Rashford] not performing very well – he was giving everything. I could never demand more. I could only support and say better days will arrive. But always super happy with a young and talented kid. Smalling is recovering from a knee injury he sustained last month. Initially expected​ to be back in Mid-May, he is now expected by his manager to recover quicker and make a comeback. The England international was also questioned in November after a win against Swansea. It was later revealed that Smalling had suffered a toe injury then. Mourinho, however, doesn’t seem to care much about this and the impact of public rebukes. “I don’t care. I just try to be who I am. I try to be honest and direct. I don’t think about the consequences. Give me everything I’m happy for that. If you don’t I ask you for more,” he added. Jones is recovering from a broken toe. It remains to be seen if he can indeed make a comeback against City on Thursday. If he doesn’t, Mourinho will be forced to play Daley Blind alongside the only recognised centre-back Eric Bailly. Marcos Rojo has been ruled out for the season, giving rise to such a tricky situation for the Red Devils. It is also a reason the coach is desperate for one of his central defenders to make a comeback. Even though United players seem to trust the Portuguese and his unorthodox methods, his latest comments have taken them by surprise, and they still believe his treatment of Jones and Smalling is very much unfair. Written by RVK. Tweet to get in touch with him.